It is with great pleasure that we can announce annual community benefit payments for 2017 to the parishes of Bere Regis (Dorset), Wanstrow & Witham Friary (Somerset), Dyrham & Hinton (South Glos) totalling just over £28,000. This is slightly down on 2016 and due primarily to lower than average wind speeds. Distgen continues to deliver on the pre-planning promises to put money back into the local communities hosting our Rogershill Farm, Landmark Farm and Talbot Farm wind turbines having now donated nearly £82,000! In each case the payments are made directly to the Parish Councils to be spent on behalf of their electorate, often financing local initiatives that might otherwise struggle for funding in the current economic climate. Thank you so much for the contribution it is always greatly received and enables us to do so much that we would otherwise be unable to do. At the moment, we are looking to build a new village hall as the one we have is too small and not particularly disabled and elderly friendly. A larger hall will enable us to increase the number of people we can invite to our monthly lunch club for the over 60s, hold more community events and enable the doctors’ surgery to carry out more treatments than their current facility allows – physiotherapy sessions for example. It is with great pleasure that we can announce record levels of annual community benefit payments for 2016 to the parishes of Bere Regis (Dorset), Wanstrow & Witham Friary (Somerset), Dyrham & Hinton (South Glos) totalling just over £34,000 ! Distgen continues to deliver on the pre-planning promises to put money back into the local communities hosting our Rogershill Farm, Landmark Farm and Talbot Farm wind turbines having now donated over £58,000 in just 3 years. Bere Regis Parish Council would like to thank Distgen for their funding over the last 3 years which has enabled us to carry out many schemes around the Parish that we would otherwise be unable to. Examples of such initiatives are the clearing and ongoing upkeep of our rights of way, continued funding of the Lengthsman Scheme after it’s withdrawal by DCC, ongoing support of the community lunch club and NeighbourCar schemes to enable them to provide vital services to the elder residents of the community and upgrading the Souls Moor Footpath once the building of the new school has been completed. We have just received this years funding and will be discussing how to allocate that at the July Parish Council meeting. SOLD OUT! – We’d like to extend a big THANK YOU to our new investors and the dedicated team at…. 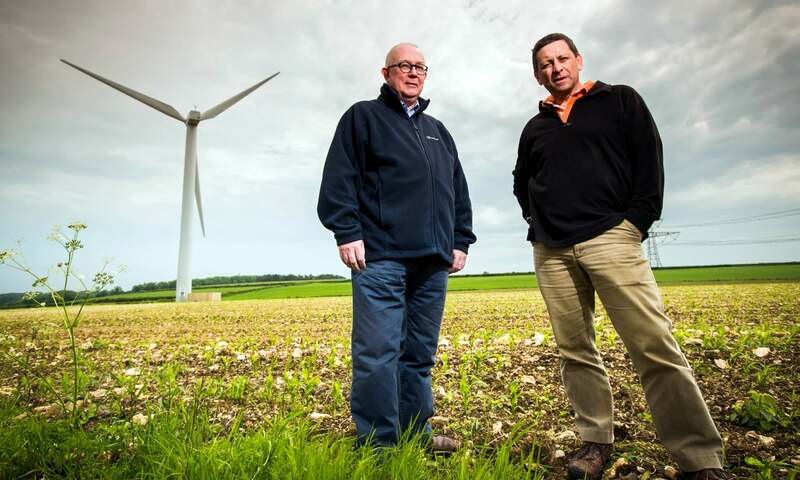 Following the huge success of our Rogershill Farm investment offer last year, we’ve teamed up with Abundance Generation Ltd again and have today launched our latest debenture based offering on our Talbot Farm wind turbine in Gloucestershire. Full details are available on the Abundance web site including the prospectus and interactive returns calculator. To donate a fixed percentage of gross annual income to the parish for the lifetime of the wind turbine. It is with great pleasure that today we announced our 1st community payment to the parish of Dyrham & Hinton from operation of our Talbot Farm wind turbine. The interim payment of £2,000 covers the just the first quarter of 2015 and during a period where the turbine still had a few teething troubles and so we expect next years payment to be MUCH MUCH BIGGER! We understand the funds have already been committed to purchasing two new gazebos for community events hosted within the parish. Given the British weather we suspect they will get lots of use! This brings total community donations from distgen wind turbines to over £25,000. It was with great pleasure that we made our 3rd annual community payment to the parish of Bere Regis in Dorset this week. With the Rogershill Farm turbine operating at near 100% availability over the past 12 months we’ve been able to donate the sum of £6,194 which takes total payments to over £16,000 since switch-on! Community payments for Wanstrow/Witham Friary (DG004, Somerset) and Dyrham/Hinton (DG005, South Glos) are expected very shortly. Distgen is pleased to announce that the second community reward payment from our Rogershill wind turbine will be £6,964.08. This will bring the total reward payment for the residents of Bere Regis to over £10,000! The parish council in Bere Regis are currently developing several schemes including a ‘neighbourcar’ service to combat rural isolation (having lost their bus service to Poole), a trim trail and skate park and some pathways located centrally in the village to make the countryside more accessible for the less mobile elderly residents. These are all very worthy projects that we very happy to be able to help through our continued community rewards scheme! UPDATE… we are now officially supporting both the Neigbhourcar and Lunchclub initiates within the local community with the distgen logo displayed prominently on various flyers and forms! Distgen staff recently met some of the volunteers who run the service and one of their clients to see first hand how much difference this makes combating the very real issue of rural isolation. 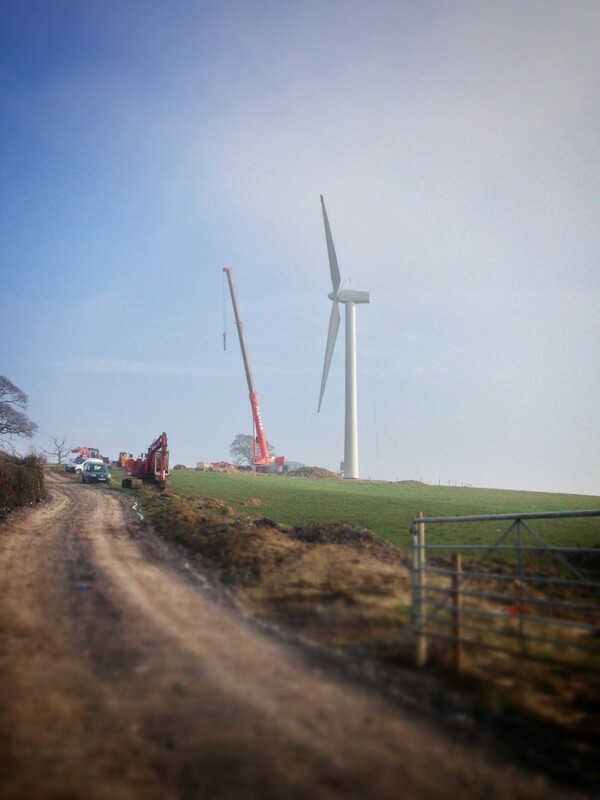 Finally after months of delay due to the record wet weather, site conditions improved enough to allow final erection of our wind turbine in Wanstrow, Somerset. Despite some morning fog the turbine was craned into place in just two days. The turbine will now be fitted out internally and then commissioned hopefully by early next week. Today the Planning Inspectorate have decided to allow our appeal for the mid-sized wind turbine at Brayton Park, Aspatria in Cumbria. Previously we had already won an appeal for a similar sized wind turbine at this site but had not been allowed to make any modifications to the permission without submitting a new planning application – which predictably led to refusal by Allerdale planning committee members (despite another recommendation to allow by planning officers) and a hence another appeal. Residents of Allerdale may perhaps be wondering whether the council is spending their money wisely in their continued obstruction of any and all wind energy related applications. Previously it was leaked that the council had spent 80 thousands pounds fighting (and loosing) multiple appeal cases. Naturally we are delighted by this decision and look forward to Brayton becoming our 6th operational turbine. The inspectors decision can be downloaded here. Our wind turbine at Rogershill Farm in Dorset is now one year old! Despite a relatively wind-free summer DG002 has produced over 1,000,000 kWh of clean energy which amounts to a CO2 saving of 430,000 kg and met the annual electricity demands of 250 average households. In June we made our first donation to Bere Regis Parish Council with 3% of all future gross income promised to community rewards. In other news, our newest turbine (DG003) in Westray is now fully commissioned and operational. DG004 in Wanstrow (Somerset) is now under construction with foundation concrete being poured within days and DG005 in Tomarton (South Glos) scheduled for construction Spring 2014. Our first turbine in Faccombe (Hampshire) is approaching its second birthday and continues to run well.